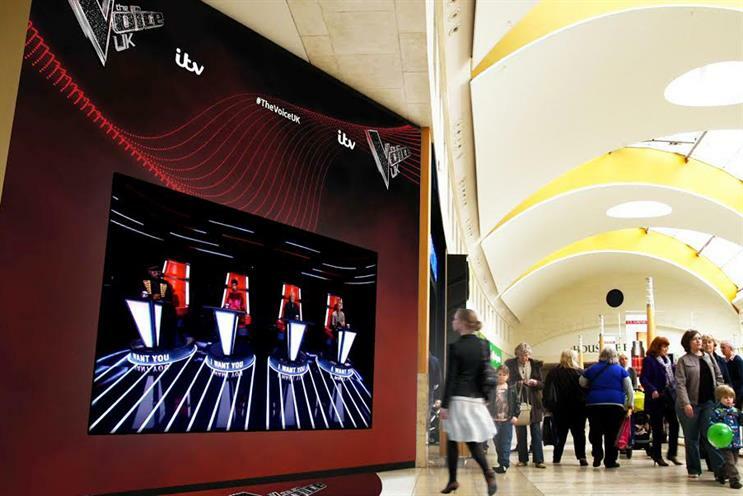 ITV has launched an interactive outdoor campaign to promote this weekend's debut of The Voice UK which features the show's judges spin round to greet shopping centre visitors. The week-long campaign, created by ITV’s media agency Goodstuff and Talon Outdoor, comprises digital screens featuring the singing talent show’s four coaches who spin around when shoppers are nearby. Pop star Will.i.am, who has starred on the show since it launched on the BBC in 2012, returns to the rebooted show on ITV on 7 January alongside Sir Tom Jones, Gavin Rossdale and Jennifer Hudson. The campaign features the coaches sitting in their famous red chairs with their backs facing the public. Each time a shopper passes close by the content is triggered and the chairs spin round to reveal the all-star cast, accompanied by claps and cheers and the call to action to tune in to ITV at 8pm on Saturdays. The digital activation was built by Grand Visual using passive infrared sensors and will feature in shopping centres including Bluewater in Kent and the Bullring in Birmingham. The Voice will be sponsored by Domino's and feature animated idents created by Iris. Each of the five series shown on the BBC has attracted an average audience of between 6.5 million and 8.5 million viewers. The most recent series, however, saw a 24% dip in viewer numbers from the previous year. Meanwhile ITV's The X Factor saw audiences decline again last year to a new low of seven million for the show's final in December, down 15% on the previous year. Natasha Reddy, marketing manager for entertainment and daytime at ITV, said: "One of our main objectives with launching The Voice on ITV was to make the campaign and all comms around the launch as innovative as possible and we think these interactive panels have done just that."